The world of Westeros has nothing on a honey bee hive. It turns out in order to gain the monarchy, a queen bee has to murder quite a lot of family members — all while waiting for a younger queen bee to inevitably murder her and usurp the throne. 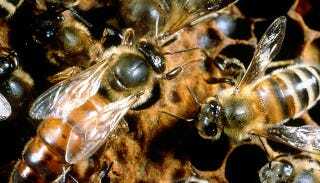 Queen bees start out life by killing all of their sisters. Whichever queen emerges first emits a high-pitched piping sound. When the worker bees around the queen hear that sound, they quiet down (although they have the ability to pipe themselves). Other potential queens also give off a battle cry. But when you are still developing and trapped in a cell, it's a major mistake to start making noise. The piping of the un-"hatched" queens will often bring over the emerged queen. She'll rip the cell to pieces and kill her sister. As the reigning queen gets older, and workers note her declining egg production and start to build new queen cells, she will attempt to murder her children. It's not unusual for queens to approach new queen cells and tear them apart. Workers tolerate this with more fuss than they did the sororicide. They get agitated, but they still allow it. When a new queen starts emerging, though, the workers run out of patience with the old one. Sometimes they drag her out of the colony, or wall her up to die of starvation (they've been slowing down the food supply during the gestation of the new queens). And sometimes they participate in a little thing called "queen balling." The workers suddenly surround the queen, forming a ball around her. Once in position, they all sting towards the center, essentially taking out the queen the way the senators took out Caesar. Once the queen dies, they drag the body out, watch the new queen kill her sisters, and the cycle begins all over again.